Severe winter is sweeping through the mid-Atlantic and mid-West. While this is not unusual, it does make us question some of the outlandish claims about the dangers of climate change. The winter of 2019 is no anomaly. A severe winter was on the cards as sun spot activity—activity, a good predictor of Earth’s temperature—was at its lowest levels for this decade. Last weekend, daily snowfall records were declared in Columbia, Missouri (beating the previous high of 1908) and Indianapolis (equaling the record high set in 1964). As of January 13, the winter weather accounted for more than 800 crashes, 57 injuries, and 1,790 stranded motorists on Missouri's highway. Virginia reported 300 traffic crashes and 200 stranded vehicles. 70,000 customers in Missouri and 200,000 in Virginia and North Carolina were left without power. The forecast for the next week is not bright either. Eastern and central U.S. are expected to experience more winter storms and a polar plunge in the coming weeks. Despite the winter blast in the mid-Atlantic knocking out power, forcing cancelled flights, and causing hundreds of car accidents, people are not surprised by this deadly winter. That is because the winter of 2018 shattered myths about climate change. People were told that winters would become less severe and snow will disappear. Yet the winter of 2018 was anything but short. In 2018, North America and parts of Europe experienced one of the most severe winters in recorded history. 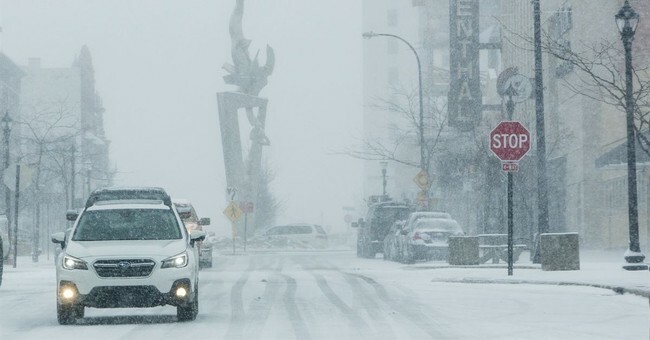 Records for lowest temperature and highest snowfall were set in hundreds of places across the North American continent. 2018 is now called a “year of records” for lows and snowfalls. The same is true in other parts of the world. Severe winter disrupted normal life in India, where I currently live. Delhi, the nation’s capital, experienced the longest cold spell in 14 years. My previous home near Delhi recorded a temperature of 35 degrees Fahrenheit, just above freezing point. Leh district of Ladakh region recorded 9 degrees, and Kargil registered 1 degree, the lowest in the country for this season. While it was normal for the mountain regions of Leh and Kargil to register such low temperatures, it was a surprise for tropical lowlands to experience such severe winter conditions. At 47 degrees, the southern city of Bhubaneswar broke the previous all-time low set 26 years back on January 5, 1992. Bidar in Karnataka recorded the lowest temperature since 1967. Bengaluru, the information technology hub of India, was close to toppling the previous record low set in 1884. The severe winter disrupted agriculture and caused losses for vineyards in central India and tea-plantations in south India, both of which are economically important specialty crops in their regions. Schools were closed in parts of the capital owing to the severe winter weather and are scheduled to re-open this week. India’s neighbor China, too, registered record-low days in December. These record-lows and the lack of warming can only be explained by global temperature patterns in the recent past. The climate pattern across the globe indicate that the temperature levels are not rising as predicted by global warming alarmists. In fact, it has been 18 years since any significant increase—an increase beyond what would be expected from a “random walk” granted past fluctuations—in global temperature occurred. The world warmed relatively rapidly between 1970 and 1999, but the warming failed to continue after that despite a very steep increase in atmospheric carbon dioxide levels (the greenhouse gas wrongly blamed by alarmists for most or all modern global warming. This apparent lack of warming is now becoming more tangible due to the severe winters. Many are beginning to see that the threats of climate change were exaggerated. This could be one of the reasons why public interest in climate change is slowly diminishing despite alarmists’ clarion calls. But the proponents of dangerous global warming continue to push their climate change propaganda in the mainstream news media. Moreover, their self-appointed role as custodians of climate science (because of their powerful positions at global political institutions like the United Nations Intergovernmental Panel on Climate Change) has allowed them to express an authoritarian attitude. The alarmists’ quickly silence climate scientists who disagree with their narrative, using smear campaigns and funding restrictions. The witch-hunt for contrarian climatologists is now a well-known fact, and the mainstream media openly call for sacking them. The alarmist attitude towards climate change is becoming increasingly obsessive, posing a great danger to our efforts to understand how the climate system functions. But the continuous lack of warming and the real-world winter weather patterns have already begun to challenge the monopoly of the climate doomsday narrative. Such a high degree of precision over something like temperature for a local area is unwarranted, indeed indefensible, and will actually generate skepticism among people with a strong science background. It's better to just round to the nearest full degree.